A bad smell can come from underneath your vehicle or from the exterior of your vehicle. Your engine might sound louder on startup, or it might be loud as you drive. Decreased fuel efficiency that occurs suddenly, or over the course of many weeks (or even months). 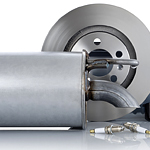 If you suspect an issue with your exhaust, give us here at Nissan North a call. We can help you with repairs, as well as a complete replacement.